KLM Promo Awards are out for this month. 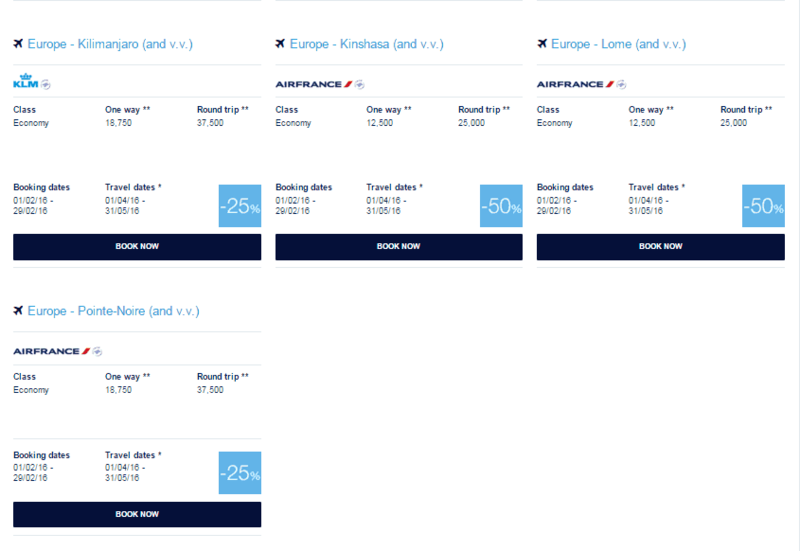 The monthly discounted mile sale with up to 50% off from KLM does offer some decent deals for those who cannot save enough for a full reward price. You have to book before 29th of February for this month’s offers. This month they have some deals in the European Special sale. Some of them don’t really present a deal considering that you will need less Avios for some of the destinations. 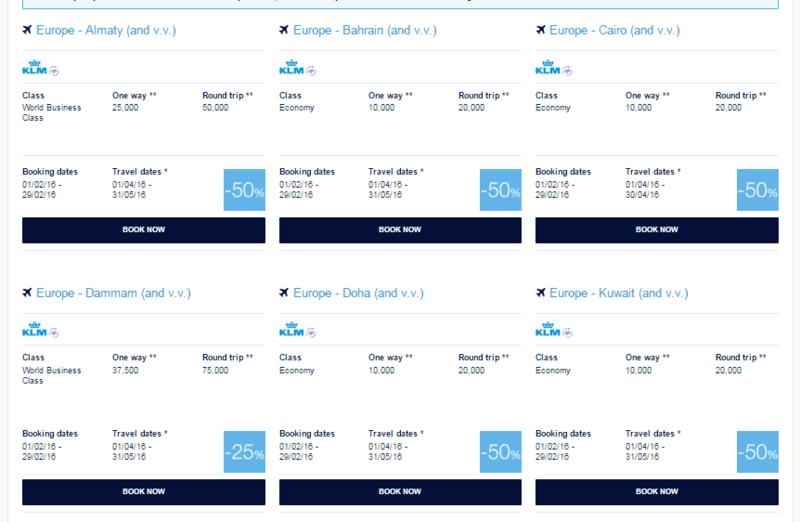 I am not totally excited about the Middle Eastern offers, though Amman is in my list and for 10,000miles seems like a decent deal. You can always combine one way with the KLM promotion one way with Avios depending on availability. Both redemptions cost 10,000 miles however the British Airways taxes are higher. Cairo, Bahrain and Doha are also in the list so if you were planning visiting one of these places it looks like a great deal for 20,000 return. I used the previous KLM promo awards for a return trip from Doha to the UK and it was very smooth and easy, plus for only 10,000 points one way and 50 euro in taxes it’s a bargain. 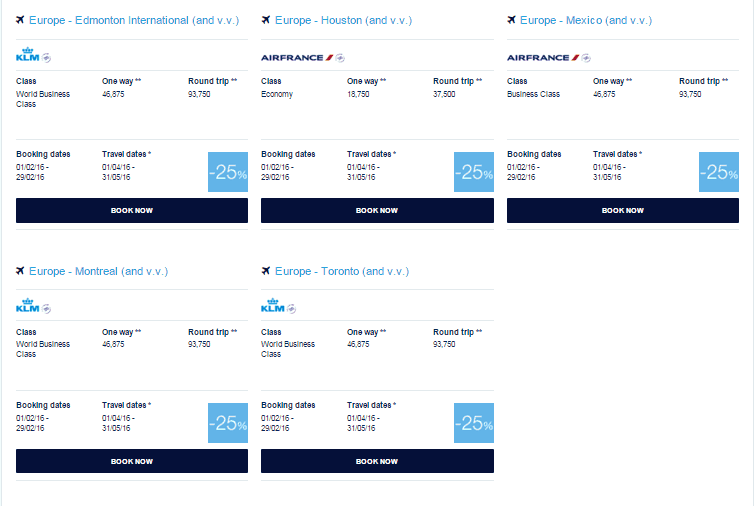 North American seems to have some options, I was looking for a flight to Toronto or Detroit to visit a friend of mine but the only option is in business class and not really worth the points. For Asia the best option seems Bangkok if the dates work for you since it is only available in May. Singapore seems to be a decent deal as well however the KLM premium economy is not a show stopper. The reviews of their inflight product are not the best they offer just a little extra legroom. However one option that seemed very attractive for me was the Dar Es Salam even with 25% discount, unfortunately the dates don’t work but I believe it is a good deal considering flights can cost £500 or more. You can view the full list of the KLM promotion here.